Abandoned at the altar, Kelly Grace Pickens finds herself left holding not only the bouquet but also the exorbitant bill for an A-list wedding. Homeless, a once promising singing career floundering, and her life bearing an uncanny resemblance to one of her country music ballads, she reluctantly accepts a last minute offer to appear on a reality TV show akin to the bachelor. Pitted against silicon-enhanced supermodels in four-inch heals, Kelly feels confident that she will be among the first would-be fiancés to be excused. Only, when the mysterious bachelor from New York City, Dillon Black, invites her to stay, Kelly finds herself thrust into the vortex of a game she doesn’t have the first idea how to play. Nursing her hopelessly broken heart while avoiding the foils of her fellow contestants, Kelly is oblivious to Dillon’s affections as she wades through hurt and betrayal to discover, in the end, that she has landed firmly on both feet. Leaving behind Nashville’s Music Row for the majestic Grand Teton mountains, Count Down To Love takes readers on a journey from duplicity to sincerity as Kelly discovers that being true to oneself is the first step in finding happiness and everlasting love. Hum, have I mentioned the word love yet? Or yummy? Oh, right. I have. Nothing makes me happier than a good romantic comedy with a happily ever after ending. Count Down to Love had everything I look for in a romance; engaging characters, humor, relatable situations, and some fantastic kissing scenes. I’m not sure if I’m proud or ashamed to admit this, but I watch the Bachelor. It’s one of those shows that you can’t help but getting sucked into and sometimes you love it and sometimes you hate it, but you keep watching anyway. Count Down to Love is like the best of the Bachelor world. There is some drama but it isn’t overdone and it isn’t the focus of the book. Instead we get to know Kelly, who is on a journey of self discovery. Having your heart hurt can do that to a girl. I love how Kelly begins to realize she can make others happy without losing herself and without giving up on her own dreams. I was also so excited to see Hurricane in the book. I lived in Hurricane, UT when I was young- we moved from there to CA when I was eight. My mom always tells how I would get so mad at people when they pronounced Hurricane like the storm with a long A sound instead of Hurr-a-cun like it is supposed to be. J It was a small connection moment between me and the book. In the book, Kelly is a singer/songwriter. During the process, she is writing a song that becomes a self revelation. I love music and I love when it is incorporated into a book. Julie Ford has done just that and I hopped over to her website and listened to the song. It's really good. What can I say? Audio and visual makes for a greater connection. I felt like I knew Kelly a little bit more. Count Down to Love is a fabulous book. I finished the book feeling happy, with a smile on my face. I enjoyed every minute reading it and now that I’m thinking about it, maybe I’ll go back and read it again. You can find out more about Julie Ford here. You can buy Count Down to Love here. You can find Kelly's song, Who I Am here. I really enjoyed this book too -- even though I'm not really a fan of reality TV, it's fun to imagine "what if"! I have no idea where Hurricane is. Although, we did live in Utah for a few years. I couldn't get into watching the Bachelor. It looks like watching cat fights! LOL! 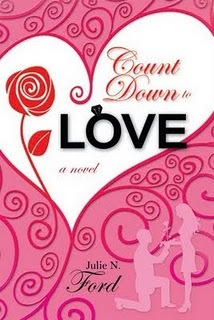 "Count Down to Love is a fabulous book. I finished the book feeling happy, with a smile on my face." Gosh, I want that feeling, too! I love reality t.v. and I love romance books! So excited to have a book that contains aspects of both. Can't wait to read this, sounds like it's a great read!!! I think this sounds like a really fun book and I'd love to read it!! Great review! I am excited to read this one!